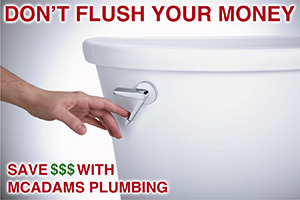 McAdam’s Plumbing was the best call we could have made. We have been getting a strong and inexplicable sewage smell in our home. We have had the city and various plumbers here trying to figure out where it was coming from, but to no avail. Many of them were sure that we needed to cut into various walls and check multiple pipes to look for a leak. 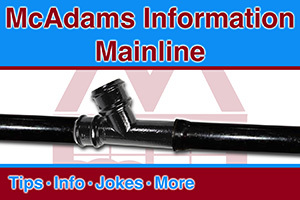 We decided to call one more plumber and were referred to McAdam’s Plumbing. The owner came (on-time) and for some inexplicable reason, the smell was not evident that morning. Despite not having a way to trace the smell, the owner kindly stayed and carefully analyzed my house (inside and out). He was determined to help me figure out how the sewage gases were leaking into my home. His determination and perseverance paid off. His expertise led him to discover a small hard to reach drain under one of our AC units with a dried out p-trap. He made a very cost-efficient proposal to keep the p-trap filled with water. The smell is gone and he truly restored our quality of life and saved us thousands of dollars that other plumbers were sure we needed to spend in order to locate the smell. I would highly recommend using McAdam’s plumbing and they will undoubtedly be the first call I make in the future. Thank you McAdam’s!! !